Thank you for this postcard Sandra! Advertisement for 'Ramses, Divine Ruler on the Nile' exhibition held by the Badisches Landesmuseum at the Karlsruhe Palace. Exhibition runs Dec 17 2016-June 18 2017 and showcases statuettes on first time display. 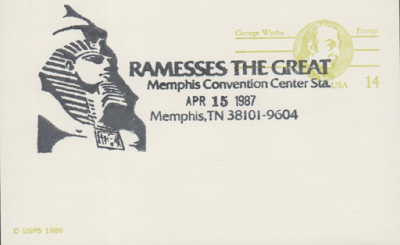 Postal card with a cancel advertising a travelling exhibition in Memphis, TN., of Ramses (of Ancient Memphis) and associated material. The show ran from mid April-August 30 1987. 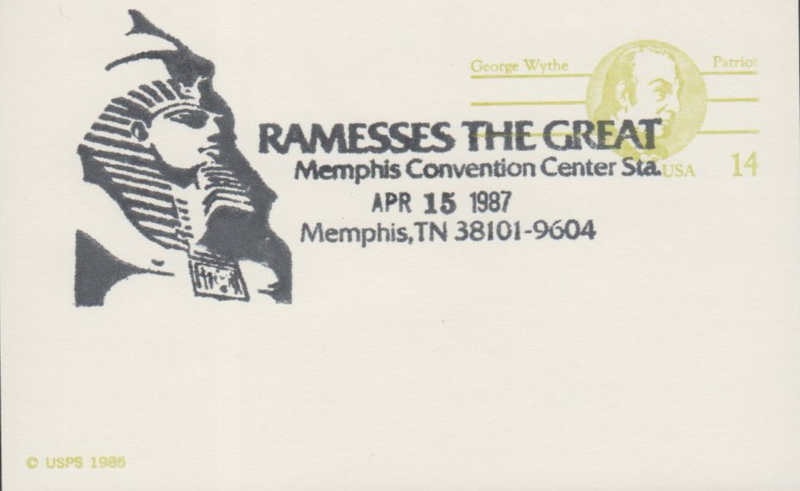 Apparently, all ticket sales went towards monument restoration in Egypt. This card is still available on buckacover here (scroll to nearly end).